You need to create API credentials – OAuth Consumer Key, OAuth Token Secret, and OAuth Consumer Secret. At the moment this extension supports one-way synchronization from Magento 2 to QuickBooks. Magento 2 QuickBooks is fully compatible with QuickBooks Online. 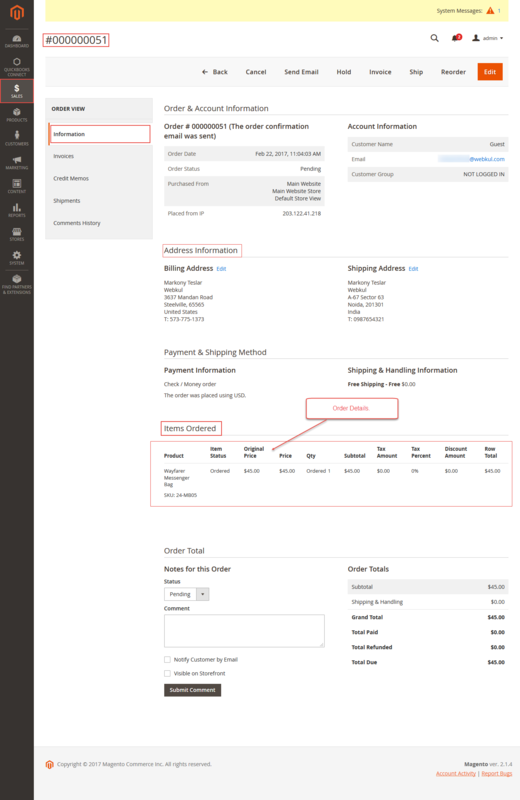 Auto-Sync Orders placed from the Magento 2 Store to the QuickBooks. Admin can manually synchronize the Magento 2 store – Orders. When a new order is placed in the store, it is automatically created on Quickbooks. 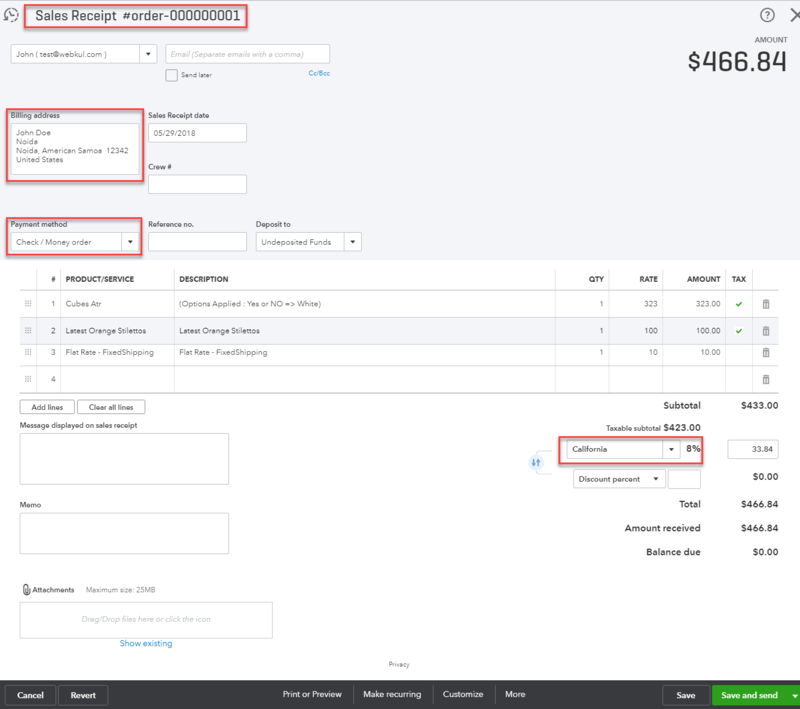 Select when to create Sales Receipt in Quickbooks – Order Place, Invoice Create, or Order Complete. Select which orders to sync with Quickbooks – Pending, Processing, or Complete. The Quickbooks sales receipt number is same as Magento 2 order/invoice number. Sync customer name, email, billing address, order date, product name, quantity, rate, amount. Sync Guest customer orders from Magento 2 to Quickbooks. After the successful installation, you have to run the below-mentioned commands in the Magento 2 root directory. After running these commands, you have to flush the cache from Magento admin panel by navigating through->System->Cache management as shown below. If you need to do the module translation, please navigate to the following path in your system app/code/Webkul/QuickbooksConnect/i18n. On the Sign-in page click “Create an account” to create a new account. Or, Sign In with your existing account. Now, enter the details required for registration and then click the “Create Account” option on the registration page. After clicking the Create Account option your account will be created on QuickBooks and after that, you will see a page that has an option to choose “Choose an App” or “Select APIs“. Tap the option – Select APIs. Now you will see a pop-up on your screen. Check the check-box option- Accounting and click the option Create app on the bottom right-hand side. Now, go to the Settings menu option and rename your new app and click the Save button to save the changes. It’s just that you can recognize your app easily. Now, go to the “Keys” menu option. Here you will find your – App Token, Oauth Consumer key, and Oauth Consumer Secret. Copy these keys to the module configuration part in the admin panel. To get the Client Id and Client Secret for the OAuth2 authentication navigate to https://developer.intuit.com/. Now, create a new account even if you already have an account by clicking the SignUp button. Now, go to the “Keys” menu option to find your – Client ID and Client Secret. Copy these keys to the module configuration part in the admin panel while using the OAuth2. 1. You must set the redirect URL. To set the redirect URL click the Add URL link, enter the redirect URL and click the save button after that. As shown below, example.com is your site URL. 2. If you are using the application in the sandbox mode then you can make use of Development keys. If you are using the application in the Live mode then you can make use of the Production keys. 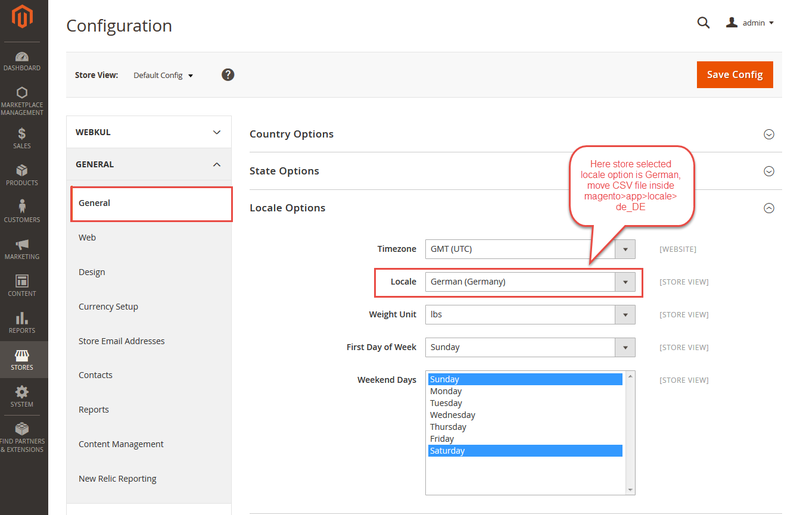 After the successful installation of the Magento 2 QuickBooks Connector module, you will be able to see the configuration panel under Store-> Configuration ->Webkul->Magento QuickBooks Connect. Enable: Here the admin will enable or disable the module. Sales Receipt Create on Quickbooks: Select one of the options from – Order place, Invoice Create, or Order Complete to automatically generate the receipts in QuickBooks. Initial Order Status for Sales Receipt: Select one of the options from – Pending, Processing, and Complete to set the order statuses that should be synchronized with the QuickBooks when synchronizing manually to create the sales receipt on QuickBooks. Select the Account Type as – Development or Production as required. 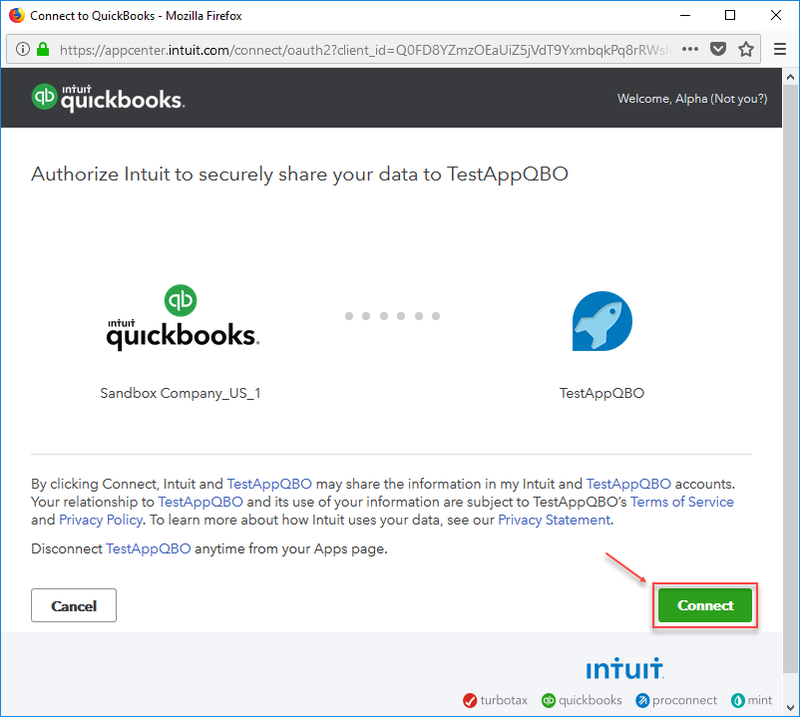 Now click the option “Connect To QuickBooks” for Authorizing Intuit to securely share your data. Tapping the option “Connect To QuickBooks“, you will see a window pop up where you have to first login to your QuickBooks account to proceed further. Now on the pop-up that appears, authorize your application to submit data on your behalf. Click “Connect” to allow the application. 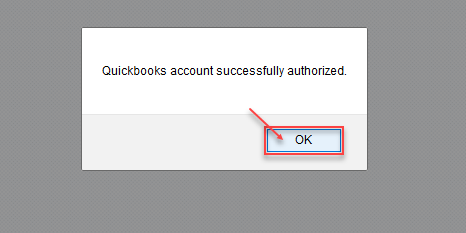 After this, you will see a confirmation message that the account is successfully authorized, Just click Ok. Finally, you will be redirected back to the admin configuration settings for the module. Here, Just refresh the page and you find that you are now connected and authorized as per the below screenshot. Now click the Save Config button to save the configuration settings. Select the account for the products created in the QuickBooks. The selection made here for the asset account will reflect on product information in QuickBooks. It’s an account to which a product belongs to so that it allows for an easy management at a later time. Select the account for the products created in the QuickBooks. The selection made here for the income account will reflect on product information in QuickBooks. It’s an account to which a product belongs to so that it allows for an easy management at a later time. Select the account for the products created in the QuickBooks. The selection made here for the expense account will reflect on product information in QuickBooks. It’s an account to which a product belongs to so that it allows for an easy management at a later time. Admin will find the menu item QuickBooks Connect -> Map Orders under his admin panel as per the screenshot below. After clicking the menu option – “Map Orders“, you will see a complete list of your store orders as shown below in the snapshot. Here, the admin will be able to see all the placed orders within the web store. Using the manual sync, you can also sync the already placed orders within your store that were placed before installing the extension as well. Apart from this the admin can also delete the Order Map Record and can Reimport Orders again as required. To check the order details for any particular order just click on the View Order link. Now to manually synchronize this data, you will tap on the option “Import Orders in QuickBooks“. At this time all the orders that have the status of “Processing” will be synchronized with the QuickBooks. You can change the settings in the module back-end if you want to choose a different order status to be synchronized. You can select from three order statuses – Pending, Processing, and Complete. If you select pending then all the orders with the status “Pending” will be synchronized. Similar is the case with other two statuses. After clicking the “Import Orders in QuickBooks” option you will see the execution message with the number of orders to synchronize. In the case of automatic synchronization, it will depend on what the admin has selected in the module configuration settings. 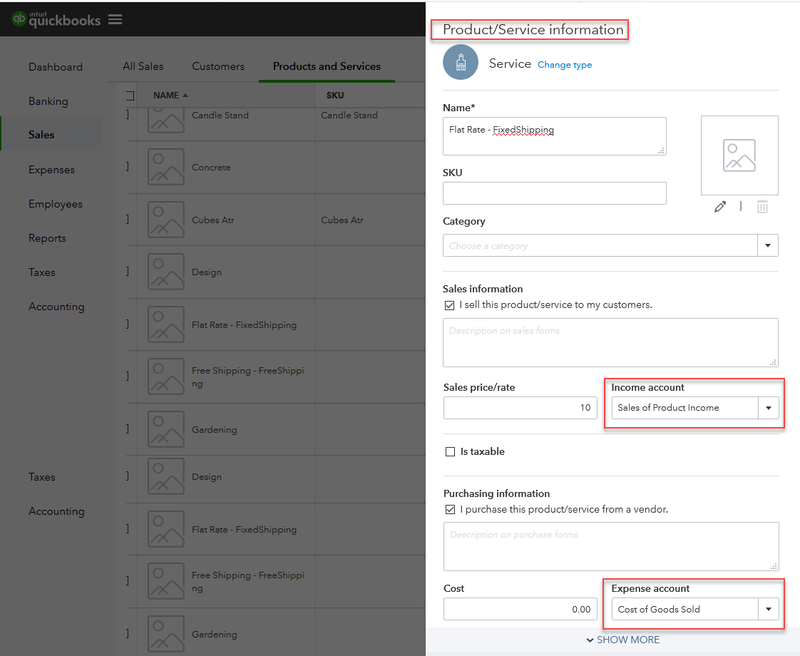 If the admin has selected the option “Sales Receipt Create On QuickBooks” as “Order Place“, then all the orders when placed in your store will get synchronized with the QuickBooks automatically. Similarly, if the admin has selected – “Invoice Create” then when the admin creates the invoice for the orders, the orders will get synchronized automatically. Same is the case if the admin has selected -“Order Complete” the orders will get synchronized with the QuickBooks when the status of the order turns to “Order Complete” i.e invoice and shipping have been generated. If the admin has selected the option “Sales Receipt Create On QuickBooks” as “Order Place“, then whenever an order is placed on your store, be it a guest or a registered user it will automatically be synchronized with your QuickBooks account. To check the order details navigate to QuickBooks Connect-> Map Order. Now, tap on the “View Order” link for the respective order for which you want to check the order details. Tapping the “View Order” link, the order details will appear as shown below. Go to your QuickBooks account and navigate to the Sales section and then tap the same order number. After tapping on the Order Number, you can see the complete order details that are synchronized as shown below in the snapshot. At Quickbooks online go to the products and services tab under the sales menu. After clicking the Edit link for a product, you can see the various accounts that are related to this product under the product/service information section as per the snapshot below. 1. How it works with the special prices? Special Price: For example, you have a product for $30, that has special price applicable of $20. Now, when the order gets purchased and the sales receipt created at QuickBooks end the receipt has $20 visible on the receipt of the product. 2. How it sync payment methods. Whichever payment method is used at the store end for making the payment, that will be reflected. For the bundle product, all of the constituent products are created as individual products within the sales receipt. That’s all for the Magento 2 QuickBooks Connector if you still have any issue feel free to add a ticket and let us know your views to make the module better at webkul.uvdesk.com.